What a glorious day to be outside painting! This evening kicked off the Six Sundays in Spring free concert series held in the beautiful E. Carroll Joyner Park in Wake Forest. Steve and I set up my easel and pastels under the pecan grove where he took some spectacular photos while I painted a small landscape of some of the park trees with a little (well, okay, a LOT) of artistic license thrown in. I'm still not comfortable painting structures, such as the barns scattered around the park, but hopefully I'll become more at ease with that and eventually start putting them in my paintings as well. 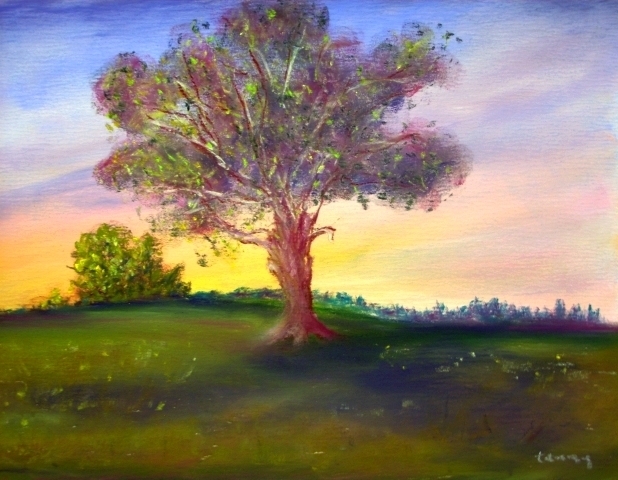 © 2014 Tammy Kaufman - Joyner Park Fantasy - soft pastels on Uart 500 sanded paper 6" x 9"
I had a lovely time painting en plein aire at the park, and look forward to the next few weeks as well. Hopefully next time I'll be able to set up a little closer to some of the other members of the Wake Forest Guild of Artists. I believe one other member was there this evening, but we ended up on opposite sides of the park lawn! I did, however, have the opportunity to chat with an extremely talented street artist who was painting some fabulous creatures and flowers on the paved paths, to the delight of children and adults alike.